There are reports in some sections of the media that based on rumours regarding the financial strength of ICICI Bank, depositors are withdrawing cash at its ATMs and branches in some locations. It is clarified that the ICICI Bank has sufficient liquidity, including in its current account with the Reserve Bank of India, to meet the requirements of its depositors. The Reserve Bank of India is monitoring the developments and has arranged to provide adequate cash to ICICI Bank to meet the demands of its customers at its branches/ ATMs. The ICICI Bank and its subsidiary banks abroad are well capitalised. Your money in ICICI bank is Safe. SAFE. SAFE. Don't fall prey to rumors. The vote against the measure was 228 to 205, with 133 Republicans turning against President Bush to join 95 Democrats in opposition. The bill was backed by 140 Democrats and 65 Republicans. Today market would open with some 150 points downside gap . My only advice is stay away from the market today. But my gut feeling is that the Nifty would soon recover and move past 4000 soon. Please note that shares bought on September 29, 2008 should not be sold on September 30, 2008 as the banks are closed due to half yearly closing. Trades done on both these days will be settled together on October 03, 2008. India's largest online market place ebay.in has announced a new offer. You can buy any product listed under this offer which includes selected mobiles and digital cameras. If you find the price of the same product elsewhere lower than ebay, you will be given the double the amount worth gift voucher. For terms and conditions, please click here. Offer closes on Sep. 30th, 2008. India Infoline in it's weekly news letter adviced buying of Dabur India and Selling of SBI, HDFC and PFC. For full report please click here. The Reserve Bank of India (RBI) has launched the RBI Young Scholars Award Scheme to generate interest in and awareness about the Indian banking sector and RBI. Under the Scheme, the RBI will select a maximu of 150 young scholars through a countrywide competitive examination and awarded scholarship. Selection test will focus on the role and functions of RBI and banks in India and will be held in English as well as in all major regional languages. currently pursuing their undergraduate studies in any subject under any recognized university in India, are eligible to take the competitive examination. There is no application fee. The selection test will be held on January 11, 2009 at various centres across India. The results of the selection test are likely to be announced in the middle of March 2009. Box No : 8587, Mumbai – 400 101. US financial market woes are far from over. One disturbing point is that how the world's best brains and economists missed the forecasting of this financial disaster. It seems one day USA itself files bankruptcy and the experts always coming out with multiple reasons after everything happened. Ahead of weekend I didn't want to play in F&O unless I am prepared to lose the entire amount.US financial market woes are far from over. 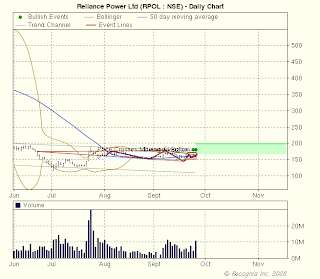 Interestingly, Reliance Power has crossed it's 50 days moving average and formed certain chart patterns which indicates the price may move past Rs.190 soon. As lot of buzz around Power sector, this scrip is a value buy at the price range of Rs120-140 (company will start producing power only after 3 years, remember) and a trade buy at current price. Buy whenever market is weak. Incremental pyramiding on the way up is recommended. Till the sun outage is over, day traders are advised to be more cautious. Tamil Nadu Government has introduced a new web facility to view the Patta Copy (Chitta Extract) and A-Register Extract for the agriculture land in Tamil Nadu online. My yesterday's market watch post holds good today also. I didn't foresee a drop below 4000. During uncertain times like this, our priority should be on protection of capital. My advice is to stay away. Those holding Nifty 4100 put may book profit (my yesterday's pick). The deposit insurance system in India is subject to the Provisions of Deposit Insurance Act (enacted in 1961). Deposit Insurance and Credit Guarantee Corporation (DICGC) is the body that operates the deposit insurance system. Q1 Which banks are insured by the DICGC? Commercial Banks: All commercial banks including branches of foreign banks functioning in India, local area banks and regional rural banks are insured by the DICGC. Cooperative Banks: All State, Central and Primary cooperative banks, also called urban cooperative banks, functioning in States / Union Territories which have amended the local Cooperative Societies Act empowering the Reserve Bank of India (RBI) to order the Registrar of Cooperative Societies of the State / Union Territory to wind up a cooperative bank or to supersede its committee of management and requiring the Registrar not to take any action regarding winding up, amalgamation or reconstruction of a co-operative bank without prior sanction in writing from the Reserve Bank are covered under the Deposit Insurance Scheme. At present all co-operative banks other than those from the States of Meghalaya, Mizoram, Nagaland, and the Union Territories of Chandigarh, Lakshadweep and Dadra & Nagar Haveli are covered under the deposit insurance scheme of DICGC. Primary cooperative societies are not insured by the DICGC. Q2 What does the DICGC insure? In the event of a bank failure, DICGC protects bank deposits that are payable in India. The DICGC insures all deposits such as savings, fixed, current, recurring, etc. except the following types of deposits (i) Deposits of foreign Governments; (ii) Deposits of Central/State Governments; (iii) Inter-bank deposits; (iv) Deposits of the State Land Development Banks with the State co-operative bank; (v) Any amount due on account of deposit received outside India; (vi) Any amount, which has been specifically exempted by the Corporation with the previous approval of Reserve Bank of India. Q3 What is the maximum deposit amount insured by the DICGC? Presently, deposits of each depositor in a bank is insured upto a maximum of Rs.1,00,000 (Rupees One Lakh) for both principal and interest amount held by him "in the same right and same capacity" as on the date of liquidation/cancellation of bank’s licence or the date on which the scheme of amalgamation/merger/reconstruction comes into force. Q4 How will I know whether my bank is insured by the DICGC or not? The DICGC while registering the banks as insured banks furnishes them with printed leaflets for display giving information relating to the protection afforded by the Corporation to the depositors of the insured banks. In case of doubt, depositor should make specific enquiry from the bank’s officials in this regard or visit DICGC website on the web address www.dicgc.org.in. Q5 different branches of a bank? The deposits kept by one person in different branches of a bank are aggregated for the purpose of insurance cover and presently a maximum amount upto Rupees one lakh is paid. The DICGC insures principal and interest upto a maximum amount of Rs. One lakh. For example, if an individual had deposit(s) with principal amount of Rs.95,000 plus accrued interest of Rs.4,000, the total amount insured by the DICGC would be Rs.99,000. If, however, the principal amount were Rs. One lakh, the accrued interest would not be insured, not because it was interest but because the amount was over the insurance limit. accounts all at the same bank? No. All funds held in the same type of ownership at the same bank are added together before deposit insurance is determined. If the funds are in different types of ownership or are deposited into separate banks they would then be separately insured. Q8 What is a single ownership account? A single (or individual) ownership account is an account owned by one person. Such accounts include those in the owner’s name; those established for the benefit of the owner by agents, nominees, guardians, custodians, or conservators; and those established by a business that is a sole proprietorship. Q9 Are deposits in different banks separately insured? Yes. If you have deposits with more than one bank, deposit insurance coverage limit is applied separately to the deposits in each bank. the same day, are my funds added together, or insured separately? Your funds from each bank would be insured separately, regardless of the date of closure. If a person opens in his name more than one account in a bank, for example Mr. K.A.Pandit opens one savings account and one or more fixed deposit accounts, all the accounts are considered in the same right and same capacity and insurance coverage is limited to a maximum of Rupees one lakh. But if Mr. K.A.Pandit opens a joint account, the joint account is considered in a different right and different capacity and insurance coverage is provided separately. Each joint account is insured separately from any deposits individually owned by the joint depositors. Each joint account owned by a combination of different persons is insured upto Rupees one lakh. All joint accounts owned by the combination of same persons are added together and the combined total is insured upto Rupees one lakh. Third a/c holder - "Shri P. Sharma"
Third a/c holder - "Shri A. K. Sharma"
Q12 Can the bank deduct the amount of dues payable to it by the depositor? Yes. Banks have the right to set off their dues from the amount of deposits. The deposit insurance is available after netting of such dues. Q13 Who pays the cost of deposit insurance? Deposit insurance premium is borne entirely by the insured bank. Q14 When is the DICGC liable to pay? If a bank goes into liquidation: The DICGC is liable to pay to each depositor through the liquidator, the amount of his deposit upto Rupees one lakh within two months from the date of receipt of claim list from the liquidator. Q15 Does the DICGC directly deal with the depositors of failed banks? No. In the event of a bank’s liquidation, the liquidator prepares depositor wise claim list and sends it to the DICGC. After scrutiny the DICGC pays the money to the liquidator who is liable to pay to the depositors. In the case of amalgamation / merger of banks, the amount due to each depositor is paid to the transferee bank. Q16 Can any insured bank withdraw from the DICGC coverage? No. The deposit insurance scheme is compulsory and no bank can withdraw from it. Q17 Can the DICGC withdraw deposit insurance cover from any bank? The Corporation may cancel the registration of an insured bank if it fails to pay the premium for three consecutive half year periods. In the event of the DICGC withdrawing its cover from any bank for default in the payment of premium the public will be notified through newspapers. Registration of an insured bank stands cancelled if the bank is prohibited from accepting fresh deposits; or its licence is cancelled or a licence is refused to it by the Reserve Bank; or it is wound up either voluntarily or compulsorily; or it ceases to be a banking company or a co-operative bank within the meaning of Section 36A(2) of the Banking Regulation Act, 1949; or it has transferred all its deposit liabilities to any other institution; or it is amalgamated with any other bank or a scheme of compromise or arrangement or of reconstruction has been sanctioned by a competent authority and the said scheme does not permit acceptance of fresh deposits. In the event of the cancellation of registration of a bank, deposits of the bank remain covered by the insurance till the date of the cancellation. Q18 What will be the Corporation’s liability on de-registration of banks ? The Corporation has deposit insurance liability on liquidation etc. of "insured banks" i.e. banks which have been de-registered (a) on account of prohibition on acceptance of fresh deposits or (b) on cancellation of license or where it is found that license can not be granted. The liability of the Corporation in these cases is limited to the extent of deposits as on the date of cancellation of registration of bank as an insured bank subject to the monetary ceilings applicable. On liquidation etc. of other de-registered banks i.e. banks which have been de-registered on other grounds such as non payment of premium or their ceasing to be eligible cooperative banks under section 2(gg) of the DICGC Act, 1961, the Corporation has no liability. For each postpaid connection a jodi card is offered free. Jodi card will have identical number (i.e. Last 5 digit only). Two levels 94878 & 94879 have been opened specifically for this offer so that MAIN and JODI cards will have the same last 5 digits. i.e. The subscriber can get last 5 digits of the mobile number matched. All calls and SMS between main Post paid number and JODI card are FREE. Local call and SMS charges from Jodi card to any other number other than Main card will be charged as per the main Post Paid card's plan. Both bills will be clubbed. This offer is valid if the JODI card is activated before 30.09.2008. To activate your JODI card, after receiving the JODI SIM, send SMS ACTJODI to 53733 from your main postpaid number. Over night steep fall in US markets (growing pessimism over the Federal bail out package) , increasing Crude oil price and nearing F&O settlement would quite naturally increase the volatility of the Index. If volatility increases, your odds of beating the market diminishes. During such times, even the best trading strategies would fail to give you profits. For retail investors, my advice is to stay away from the market. For compulsive traders buy 4100 put on opening of the trade, trail with stop loss and don't carry the position to tomorrow. As for as Reliance Industries is concerned, most of the FII are holding this company. To meet any immediate cash requirement, they tend to sell this. I don't expect our Mutual Funds and domestic institutions would buy or lend support at that time. If Reliance falls below 1500 in coming months, buy for long term. Though the valuations seems to be very attractive now compared to it's future earnings,there is every chance to get RIL even lower price. So don't enter RIL now for long term. Today, I hope ICICI Bank will be slaughtered in the Market. Today is a day for going Short. Nifty Expected range 4050 - 4250 . Market will remain close 11.25 a.m. to 12.05 p.m.
04.35 p.m. to 04.45 p.m.
Today market is expected to struck in a range (4250 - 4400) with a positive bias. As expiry of F&O contracts are nearing, Our market would have it's own preference. If the Gas discovery story of Reliance gains ground, short sellers would be trapped and the market may settle this month around 4450 -4500. Buyers of call options and sellers of Put options are advised to book profits as time decay would fast deplete your profits. Fresh long positions may be cautiously initiated with small profit targets. Again Reliance Industries holds the keys. Overseas banning of Short selling would help to stay positive. 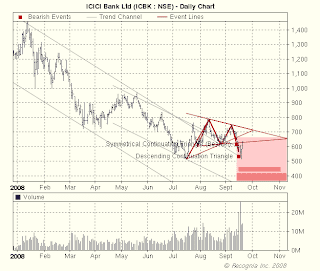 Technically ICICI Bank is very weak in charts. Though some short term indicators gives bullish indication, all the intermediate trend indicators turned sell from Sep.12 . Hence long term investors don't buy the stock now.Within next two months (see chart) it may touch Rs.400. At that time, with Fundamental Analysis, you can decide the further course of action. Is The Hindu and NDTV joining togther to start Chennai specific NDTV-HINDU? Are you a Chennaiete Generation Next? Do you like "NDTV GOOD TIMES"? If you answer"Yes" to these questions, then there is a good news for you. It seems "The Hindu" and NDTV joining together to launch "a Chennai centric channel with content being on the lines of NDTV GoodTimes, Profit & News combined". Famous Blogger, Mr.Kriubasankar narrated his interview experience with this yet to be launched channel. Why Wordpress Blogs have more Readers Comments than Blogger? My post about "online trading costs in India" was published in both Blogger(www.investchips.com) and wordpress (www.drchristy.wordpress.com). But the word press blog got more than 50 comments from readers while by blogger post got none. I didn't know the reason. If anybody knows, Please let me know. Which is the best online Broker for Indian Option Trading? Options trading in India is catching up. Almost all brokers are giving the facility to trade Options in NSE. Previously they charge brokerage on the total value of the contract. It means if you buy Nifty 4100 call option @ Rs.80 you have to shall out Rs.104.50 (@0.05% rate) as buying brokerage plus service tax and STT. Then SEBI directed the brokers to charge brokerage only on Option premium and Finance Ministry proposed to charge STT on option premium alone. Then most of the brokerage houses increased the brokerage rate from 0.05% to 1% with minimum brokerage of Rs100. So for one buying and selling you need to shell out Rs200 as brokerage alone. In the cost perspective Reliance Money beats all brokers. If you pay Rs.500, you can trade 20 buy and sells in Nifty options ( Which costs you minimum of Rs.4000 in other brokers ). Even if you order through phone, they will charge you Rs.15/executed order which is very cheep. But make sure that you open A/c online. Otherwise you will be charged Rs.15/order as Franchisee fees. If you are a option trader and woud trade atleast one trade per week, then Reliance Money is the only cost effective broker avaiable in India. India Infoline Ltd 's weekly news letter called weekly wrap can be accessed here. You yourself evaluate their quality of research. Email received from Anup Bhaiya of Money Honey Financial Services Pvt. Ltd. So what has really caused the panic button to be hit across the globe. What has prompted Gold to rally the fastest in a decade? What prompted China to cut its lending rates and reserve requirement? The one answer to the many questions is The US. What does an investor do in such markets??? Well that's a million dollar question indeed. To quote the legendary Sir John Templeton – "Bull markets are born in pessimism; grow on skepticism, mature on optimisim and die of euphoria"
Investors across asset classes continue to hinge on hope and await signs of recovery. Let me reiterate here that Indian markets are reacting to a global event – and INDIA IS NOT THE CAUSE OF SUCH AN EVENT. Hence one needs to have loads of patience in such markets. Flight for safety is supreme in such market conditions and the same can be found in Liquid and Liquid Plus funds. FMPs are best suited in such market conditions as they help mitigate interest rate risks to a large extent. Equity as an asset will remain as an best asset class in long run. SIP/STP is the best mode to avoid volatility. Asset allocation is the key. Diversify the investment in various asset classes: Equity, Debt, ETF, Real Estate, Art & paintings, Cash, etc…. "Price is what you pay. 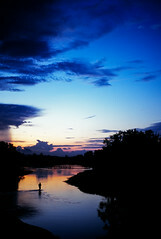 Value is what you get "– Warren Buffett. We still believe and advise our investors to do investment in equity and through mutual fund (SIP route) to reap long-term benefits. Money Honey Financial Services Pvt. Ltd.
Fidelity India enables account access through GPRS enabled mobile phones. You should have GPRS connectivity on your mobile phone. For FAQ please click here. OneIndia reported that one sub-broker named Upendra in Hydrabad with his family committed suicide due to huge fall of Indian Market. Another broker Mr. Ravi Sharma of Indore also ended his life with poison. Very sad news. My deepest condolences to their family. We should not over trade and over leverage at any time. If at all NSE and BSE created awareness on money and trade management, these incidences may not happen. We should control our Fear and Greed while investing or trading in the market.